I could not leave Florida without seeing a wild manatee. From early November to late March, the West Indian Manatees gather in numbers when water temperatures dip below 68° F. These gentle giants then gravitate toward the warmer waters of Florida’s fresh and clear water springs. Water temperatures hover around 72° F and make an ideal refuge for the warm-blooded mammals during the winter months. Since we arrived in Florida at the end of March, the cusp of Manatee viewing season, I hoped we were not too late to see them. One such place is Crystal River National Wildlife Refuge. 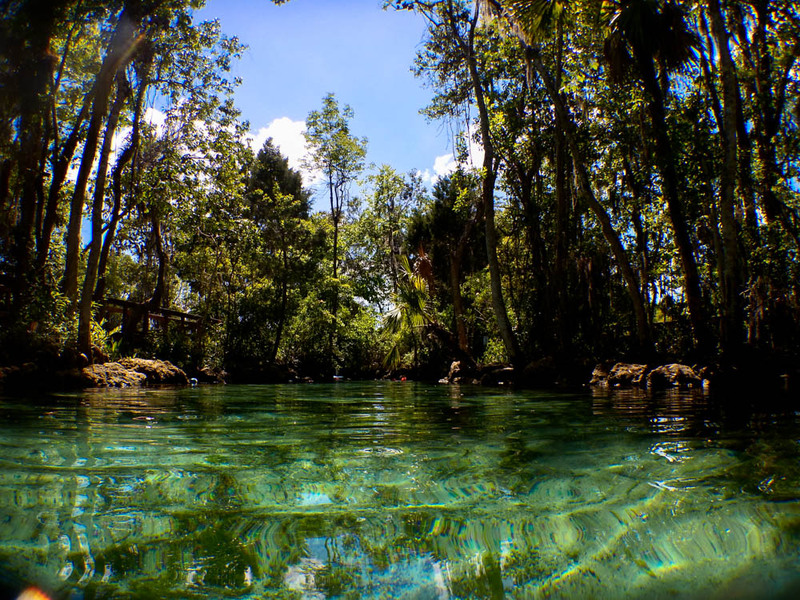 Established in 1983, Crystal River is the only refuge created specifically for the protection of the threatened Florida Manatee, a subspecies of the West Indian Manatee. This unique refuge preserves the last unblemished spring habitats in Kings Bay. Located at the headwaters of the Crystal River, the refuge protects the aquifer-fed springs of King Spring and Three Sisters Springs. 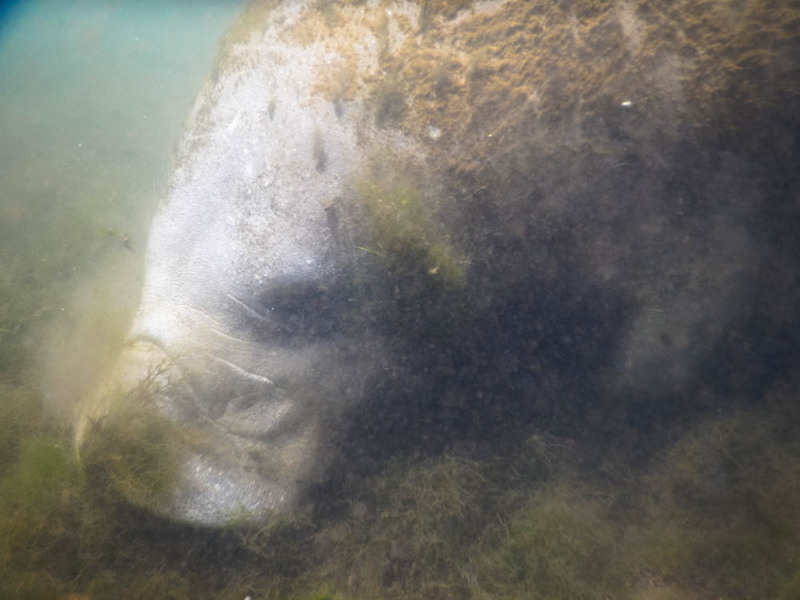 For the wintering manatee populations, these springs provide a much needed critical habitat. 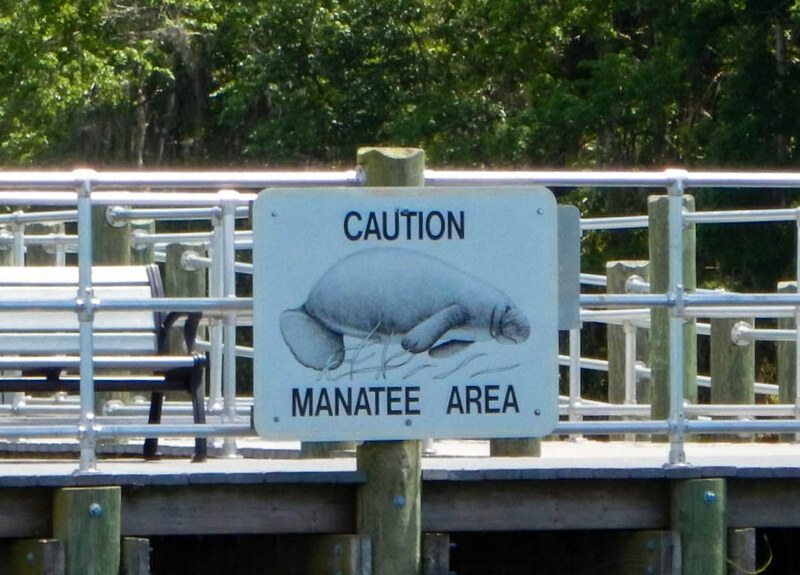 Warning Sign – humans are the most dangerous things to a Manatee. Crystal River, along with neighboring Kings Bay Manatee Refuge, I hoped we would see what few manatees were left in the area. Furthermore, much of the refuge is accessible by water only with little to no land access. Without a boat of our own, our only option was to book a tour. After a bit of research, I decided to go with Fun2Dive since they switched to their off-season rates. Located in the heart of Crystal River, the city, we found our outfitter rather easily. As we entered the store front, our guides introduced themselves, and then lead us to the back to pick wetsuits. Although they provided snorkeling gear, we decided to use our own. Before our tour, we viewed a mandatory a “manatee manners” video and learned how to protect the animals while in the water — an awkward but necessary video showing people doing all the things that people should not be doing with manatees. Aboard our boat, we quickly cast off and motor out into the river itself. Our captain makes a quick call to some friends to see where the manatees are located, then turns the boat towards on of the many canals that lead to residential homes. Within 15 minutes, we’re ushered into the water and directed to a mother and a calf, just floating under some mangrove trees. According to our guides, we don’t have to do much except float and maybe paddle a bit with our hands — the manatees will do the rest. As we drift, another lone adult sea cow wanders by, slowly feeding upon the seagrass on the bottom. Being in the water with these peaceful creatures is pretty amazing yet serene at the same time. He seemed to “walk” along the bottom. 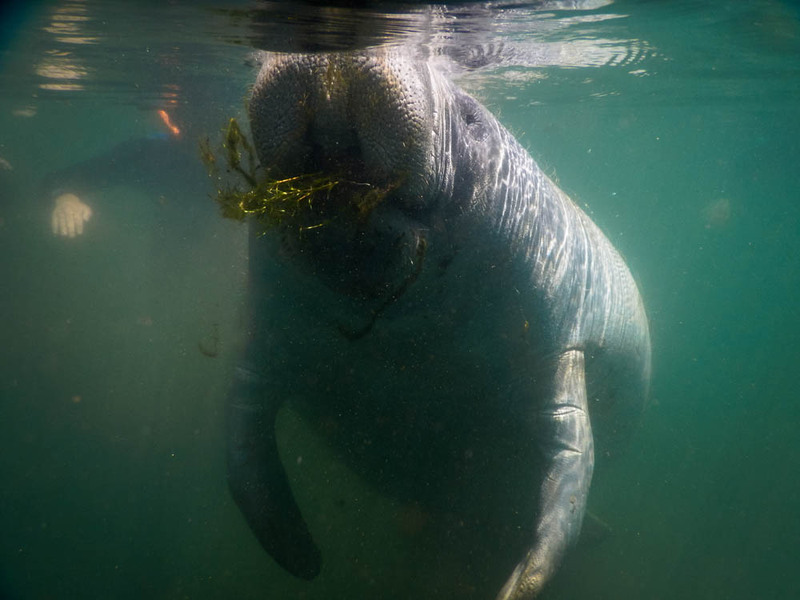 When the manatee detected plants, his nailed flippers scooped up the vegetation toward his large prehensile lips. I felt lulled by the sound of his constant underwater chewing. As I look upon this huge animals face, I can see his small eyes are somewhat hidden behind folds of skin. With poor eyesight, they have to rely on other senses. Manatees can feel water movements thousands of times smaller than the width of a human hair — an ability that makes them one of the most touch-sensitive mammals on Earth. I want to reach out and feel the manatee’s gray wrinkly skin, but we’re not allowed to stress the creatures in any way, and that includes touching. Without its federal protected status, they would probably go extinct. Although surrounded by us humans and our monstrous machines, the manatee continues to eat instead of swimming away in fear. If a manatee just happens to touch you, that’s okay. After about an hour or so floating in the water with these fantastic creatures. We climb back onto the boat and make our way toward Three Sisters Spring. Within a natural inlet on the east side of Kings Bay, there are three spring areas which contain many sand boils and vents. To access the springs, we have to swim from the boat up a short watery path. 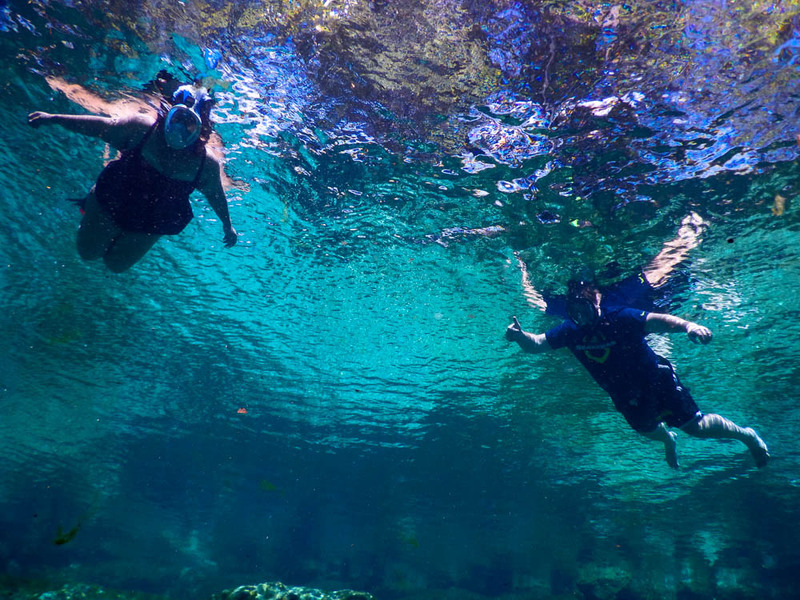 During peak season, the spring is filled to the brim with Manatees and is sometimes closed to humans depending on the “Manatee traffic.” For our group, many of the sea mammals have migrated out to Kings Bay and the Gulf of Mexico, so we are free to swim in the clear cerulean waters. The water within Three Sisters Spring is 100% clear. I can spot all manner of fish and aquatic plants. Deeper into the natural pool, the sand seeps “boil” up, delivering fresh water to the surface. Before it fell under the protection of the U.S. Fish and Wildlife Service, the water was commercially extracted and bottled. In 2008, local community efforts saved Three Sisters Springs from further urban development. Today, there are only two ways you can access the springs. On foot, via a boardwalk, and by boat, through the adjacent canal. Those who go by foot are not permitted to enter the water since they want to preserve the shoreline from erosion. And I don’t blame them for wanting to protect this habitat, the lush green tropical plants seem to frame this blue spring superbly. Back on the boat and on our way back to the harbor, we ask our tour guides where to get the best seafood in town. Both answer quickly with Seafood Seller & Cafe. We thank our guides for an entertaining afternoon. Their promises of fresh delicious fish don’t fall short, as we dine on grilled swordfish steak and blackened cod. A fantastic way to end a fun-filled manatee day. Our Captain and his boat! Do you see it Hitch? I think sea cows are cute!